Wanna get cray cray cute! I can make just about anything happen with cute fabrics! Sold fast! Went to one of my favorite customers! I loved the donuts in this fabric and the sprinkles. I can make more of these just ask! I love the vintage neon butterflies in this fabric! This type of thing is very rare now believe me I am always searching for fabrics from the 60s 70s, but lots of collectors out there. One of a kind apron in my shop now! Oh so sweet summertime vintage fabrics! 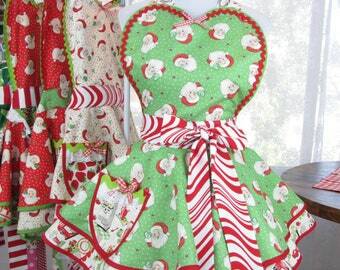 There is only one of these precious doll aprons because the fabric is so rare!